Truthfully, I was never an Alfredo fan, but obviously, this is not your traditional Alfredo sauce. It’s actually a béchamel sauce (gluten and grain-free of course), but takes on the look of Alfredo and is also creamy like Alfredo. It isn’t too rich, but is chuck full of flavor, especially with the touch of nutmeg. It’s straight up wonderful and comes together quite quickly too. Jesse and I loved this chicken broccoli Alfredo so much that we both went back for seconds. We couldn’t stop raving about how delicious it tasted either. It’s definitely a keeper and I will be making it again soon. Cut spaghetti squash in half lengthwise and scoop out the seeds with a spoon. Place skin side up in baking pan and fill pan about 1/4-inch high with water. Place pan in oven and bake for 30 minutes. Now, whip up the sauce. 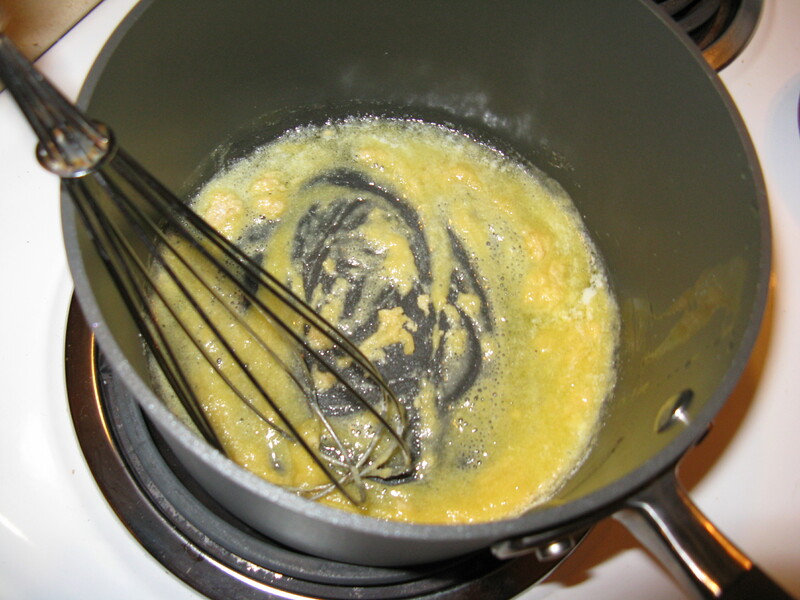 Melt the grass-fed butter in a small saucepan over medium heat and then whisk in the coconut flour to make a roux. Whisk constantly for a couple minutes and then slowly add the almond milk. 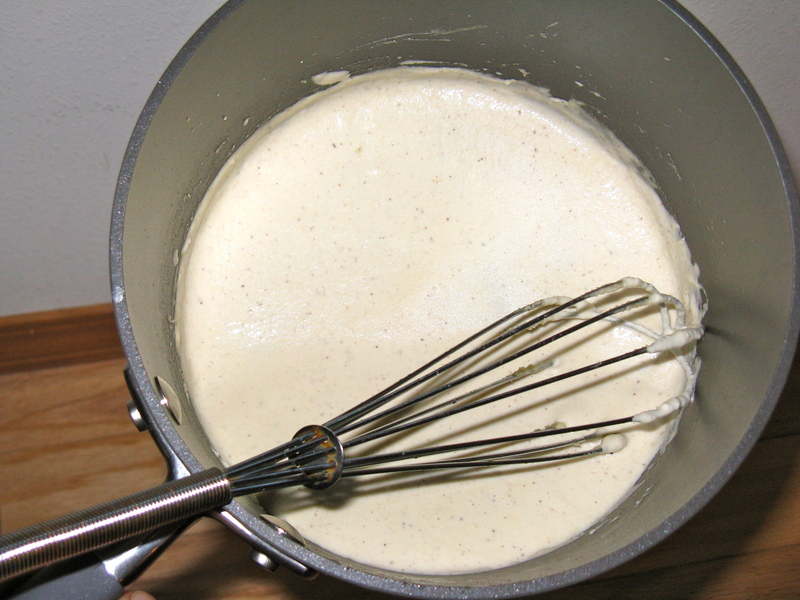 Continue to whisk the mixture for five minutes or until it has thickened. Add the nutmeg and season to taste with sea salt and pepper. Set aside. Heat ghee in a large pan over medium heat. Add the garlic and sauté briefly. Then, add the chicken pieces and season with sea salt and pepper. Let cook for a few minutes, stirring occasionally. Next, add the broccoli pieces and sauté with the chicken. Turn the heat down to medium-low and continue to stir occasionally, until the chicken is done and the broccoli is tender. Once done, keep warm over low heat. 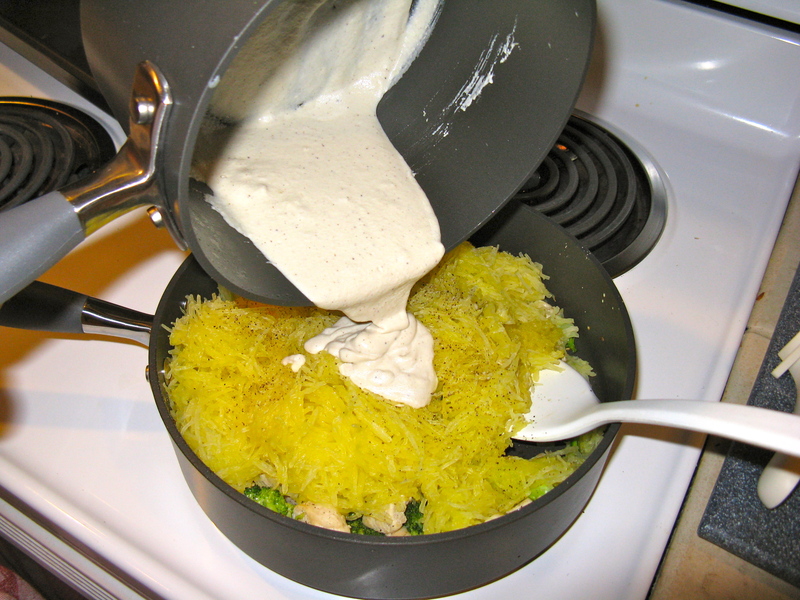 Once spaghetti squash is done and cool enough to handle, scrape out the shreds (noodles) with a fork. Add the noodles to the pan with the chicken and broccoli, and then pour the sauce over top. Mix together until well incorporated, over low heat. Add more sea salt and pepper if necessary. 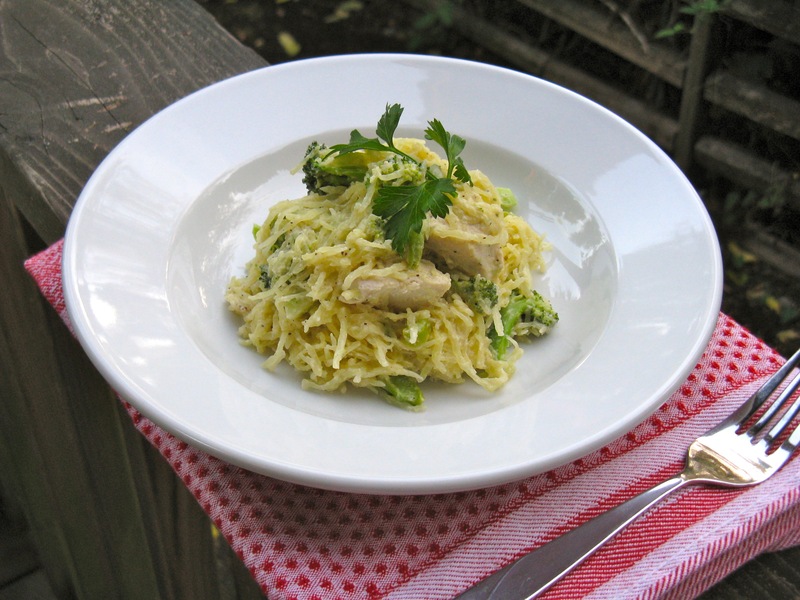 *Note: you may not need to use the entire spaghetti squash. I used half — maybe a little more — of the squash because otherwise it it was too much. Wow I never thought to make roux this way. Does it have a strong coconut flavour? No, not at all! I thought maybe it would, but it doesn’t. It’s really delicious. Thanks, it is REALLY good! Seriously, the nutmeg brings it all together. This looks truly awesome! 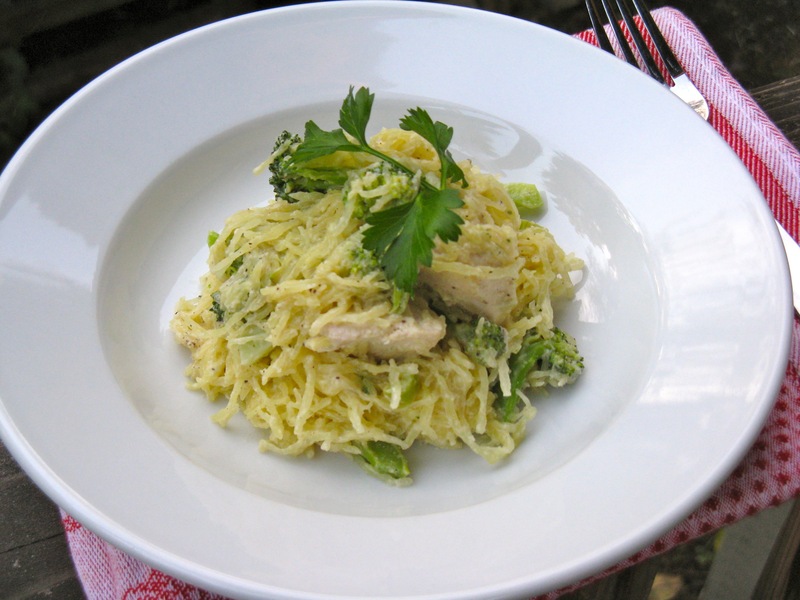 I LOVE great spaghetti squash dishes! Haha! Maybe for your next meal then 😉 It is really friggin’ delicious! I’ve already made it a second time around with some leftover spaghetti squash. The sauce is so easy and cooks up in a heartbeat. I’m not sure how well it will work, but you can try it. The flavor will be a bit different, of course, but I’m sure it’d still taste good. If you try it, let me know! Omg I want this right now! wow, I was under the impression that coconut flour didn’t work as a thickener so I haven’t tried it…I’m excited to give it a go…thank you. It works great! I use it for thickening sauces all the time, and it doesn’t leave a coconutty flavor. okay…I’m making this today…spaghetti squash in oven now…about to make the almond milk…I’ve got the broccoli ready…and I’m using beef instead of chicken…yeah, weird, but I only buy whole chickens so it’s easier to use beef and I’ve got it all nice and ready from having just made a bone broth…I boiled some neck bones…nice inexpensive meat perfect to throw into a sauce after chopping it up!! I’m already hungry! Awesome! Let me know how it turns out with the beef. Did you use ground beef? in any case, this dish made me VERY happy. And it will be a permanent addition to my menu…I used to make alfredo a lot when I didn’t know milk was a problem for me. I did add a bit of glucomannan fiber to the sauce because the coconut flour didn’t really thicken it enough for me…glucomannan is a root…I’ve hardly used it at all in cooking but it’s a very effective thickener and while paleo folks don’t talk about it at all I can’t see any reason it wouldn’t be okay. Oh, that’s right … you did say you used neck bone meat. I totally looked over that! I’m so glad it turned out and that you loved it! I didn’t have any problems with my sauce thickening, but maybe I had it on the stove a bit longer. I can’t eat that fiber you mentioned because of adhering to the scd, but I’m glad it works for you and helped you out in this recipe. That fiber would be too much starch for my system. Sorry to hear that. I didn’t know that stuff had trace amounts of gluten — even if it wasn’t the starch problem, I still wouldn’t be able to eat it then. Next time, I’d recommend leaving your sauce on the stove longer to thicken. If need be, you can always add a tiny bit of coconut flour to get it to thicken up. It won’t change the flavor.